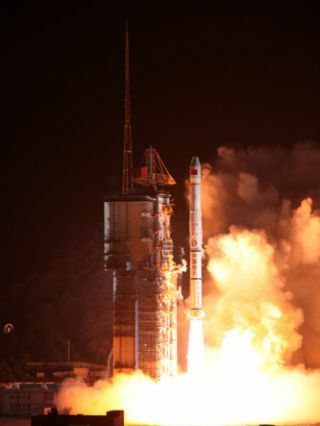 A Chinese Long March 3A rocket launches Nov. 24, 2010 from the Xichang launch complex with the Zhongxing 20A satellite. Chinaorbited a militarycommunications satelliteWednesday (Nov. 24) on a Long March rocket, continuing the country'sbusiestyear of space launches since the Chinese space program dawned more thanfourdecades ago. The172-foot-tall rocket delivered the Zhongxing20A communicationssatelliteto a geosynchronous transfer orbit stretching from alow point of 125 miles to a high point of 26,000 miles, according totrackingdata. The satellite will use an on-board propulsion system to reach anear-circular orbit about 22,300 miles above Earth. Zhongxing20A, also known as Chinasat 20A, is believed to be a Chinesemilitary communicationssatellite.Official state-owned media reported the spacecraftwould help improve the country's radio and television broadcasts. Butthe satellite likely provides secure communications coverage forChinese groundforces. Thespacecraft is based on the DFH-3 satellite bus from the China Academyof SpaceTechnology. It likely weighed about 5,000 pounds fully fueled atliftoff. Theflight was the 14th successful Chinesespace launch this year, setting a new mark for thecountry's launchindustry. Before 2010, China had launched no more than 11 rockets intoorbit ina single year.